The South Racing Can-Am Team endured a dramatic 10th special stage on the Dakar Rally and a very difficult competitive section, held in punishing heat, between Salta and Belén in Argentina. Reinaldo Varela and Gustavo Gugelmin began the day with an overall SxS category lead of 01:34:31 hours, but dropped 12 minutes before the first of the checkpoints with a belt failure and continued to cede time to their rivals as the stage progressed with a fuel pressure issue. They reached the end of the first timed section in 4th, 01:43:47 hours behind Frenchman Patrice Garrouste, and went on to complete the stage in 4th to see their overall advantage whittled down to 48:12 minutes. Juan Carlos Uribe and Javier Uribe Godoy held second overall at the start of the day in their Can-Am. 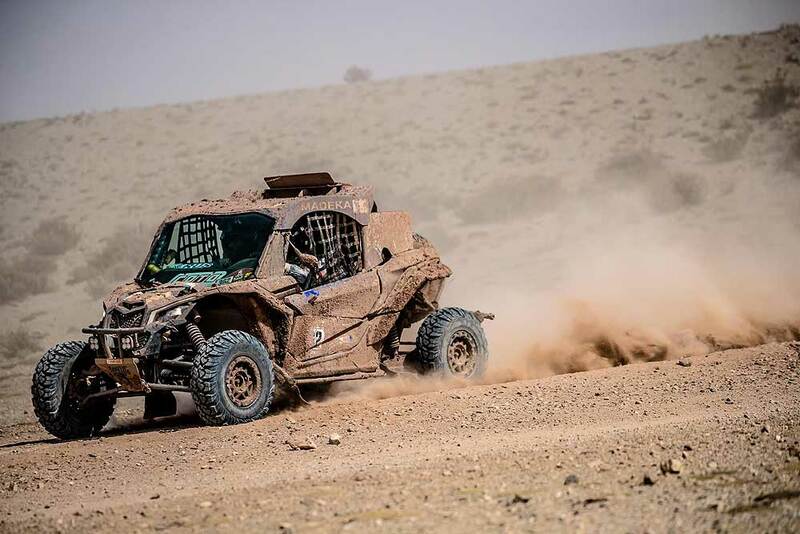 They maintained a consistent pace during the day, reached the finish of the first part 42:37 minutes behind Garrouste, and went on to record the second quickest time, albeit 01:09:30 hours off the stage win. It meant that the Peruvian slipped to 3rd in the rankings, 11:34 behind Garrouste. With temperatures into the high thirties Centigrade on the deceptive gravel tracks and through the river crossings and camel grass around Belén, the Argentine duo of Leonel Larrauri and Fernando Imperatrice began the day 3rd on the road in the second of the South Racing Maverick X3s. They moved up to second at PC1, but badly damaged the Maverick X3’s suspension and chassis after a collision with a rock after 194km. The Argentines were forced to wait for the team’s T4 support truck and were towed to the end of the first section of the special with the loss of four hours. Larrauri will be hoping that his Can-Am can be repaired before the restart to Chilecito on Wednesday. "It was a difficult day for the team," said Team Manager Scott Abraham. "Reinaldo was running well at the start of the stage. Then he blew a belt and continued with no problems until kilometer 195 when he had a fuel pressure issue, which he managed to fix on the stage and then he continued on to the end. He also had some small suspension issues with the new damper setting. We lost a lot of time overall, but we are still in a good position to capitalise over the next few days." "Unfortunately for Leo, at kilometer 194 of the first special stage Tuesday, he hit a rock in the track and ripped the rear suspension out of the car and damaged the chassis. He was dragged by the T4 into the neutralisation and the team is repairing the car with the hope of keeping him in the race."